"We cross the 'T', dot the 'I', and put 'U' in the middle". I lost count of how many times I heard that advert informing the country that Thomson had became TUI. But does a smiley logo make for a happy experience? I jetted off for to Majorca for a brief one-night ship visit to discover Marella Cruises and their latest ship, Marella Explorer, for myself. And boy was I blown away. 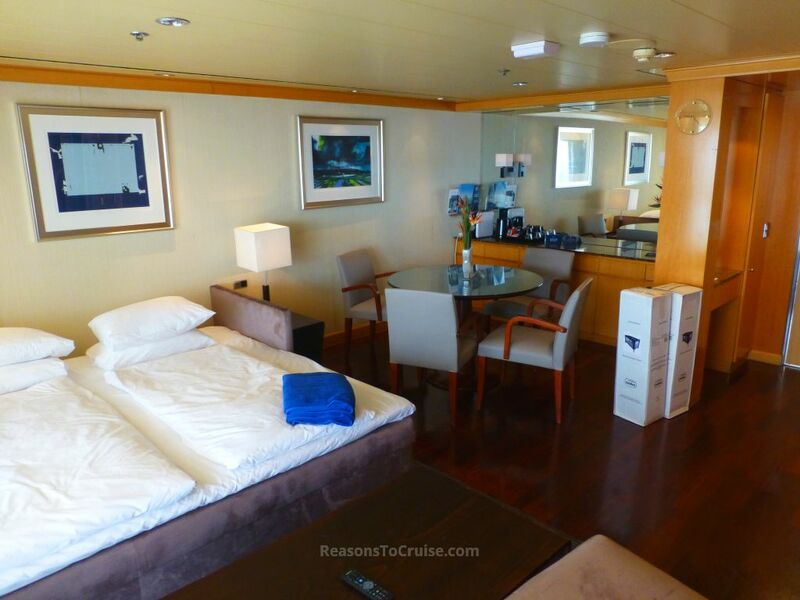 What I love about Marella Explorer? What else is on the ship? Let's start at the beginning. Marella Cruises is the new name for Thomson Cruises, and it's clear from their latest ship, Marella Explorer, that they are laser-focused on attracting a new generation of cruisers. When I first started cruise blogging, the Thomson Cruises fleet was a list of old well-travelled vessels: Thomson Majesty (built in 1992); Thomson Spirit (1983); Thomson Celebration (1984); and Thomson Dream (1986). Each of them had their charm and loyal fans but they weren't exactly groundbreaking in the 21st century. 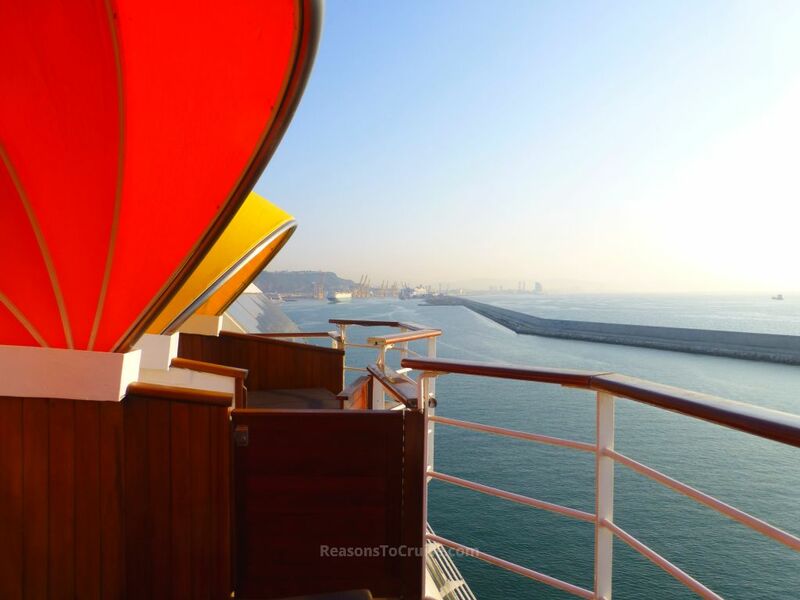 Two years ago the cruise line embarked on a seismic change. Thomson Majesty headed to Celestyal Cruises in October 2017 and Marella Spirit follows in October 2018. Thomson on the high street became TUI, and so Thomson Cruises became Marella Cruises (to avoid confusion with the German arm, TUI Cruises). Royal Caribbean's Splendour of the Seas became Marella Discovery in 2016, complete with rock climbing wall and solarium. Suddenly, Marella Cruises became much cooler and a much better option for families. Legend of the Seas followed suit becoming Marella Discovery II. That leads us onto Marella Explorer. The 1,924-passenger, 71,545 gross-tonne Marella Explorer dates back to 1996 where Meyer Werft built it for Celebrity Cruises. Celebrity Galaxy shot to fame when a then little known entertainer (Jane McDonald) landed on our TV screens in the BBC's 'The Cruise' series. In 2009 the ship moved to TUI Cruises becoming Mein Schiff 1. And then in March 2018 it headed to the Navantia shipyard in Cadiz where she became the dazzling Marella Explorer. This isn't a cruise ship. It's a chic boutique hotel. 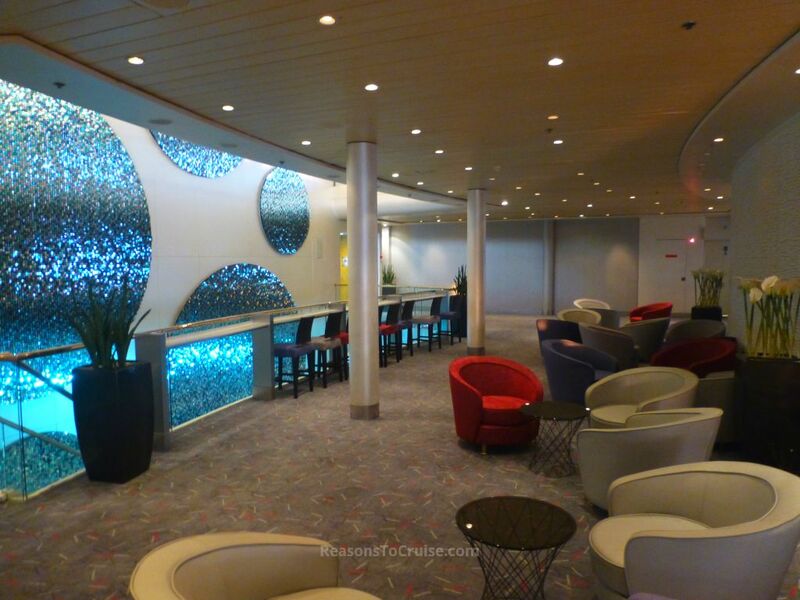 The contemporary décor works really well, and gives the ship a premium feel. 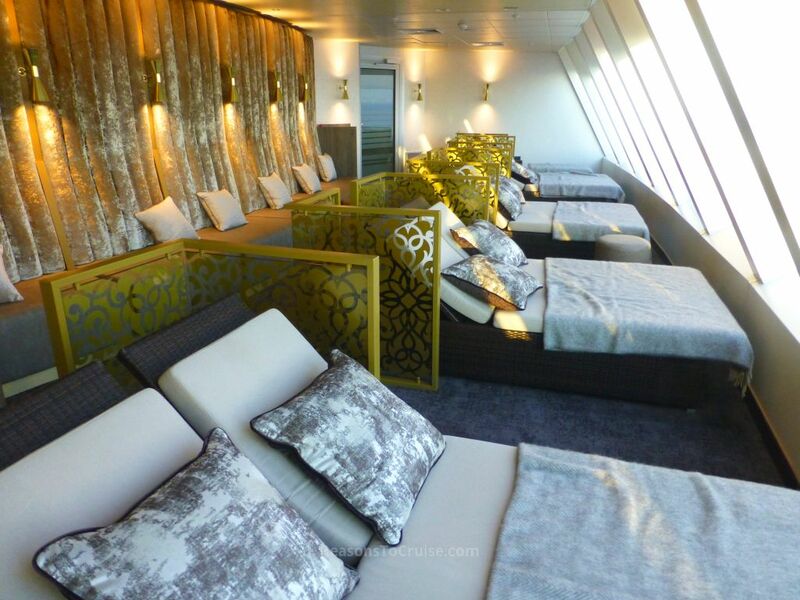 British cruising on Marella Explorer is certainly a classy affair. Art is used throughout as an accent or a focal point. From the chocolate sculpture at the café to the colourful shimmering displays, the art helps to enhance the aesthetics onboard. The contemporary décor extends into the cabins although there you'll find a mix of designs, blending original elements with the clean and modern look. The Marella-Champneys brand partnership is a marriage made in heaven, especially on a glamorous ship like Marella Explorer. The Champneys spa - the largest spa in the fleet - is just as sleek as you'd expect to find at one of their land-based resorts near Tring, Liphook, Ashby de la Zouch, Henlow, or Ashford. But that's not the only thing they share in common. The pricing onboard matches the land prices. Cruise ship spa prices aren't know for being good value for money but Marella may well repair that reputation. A 25-minute Champneys Personalised Massage is a snip at £45 while the heavenly 50-minute Clarins Deep Muscle Body Massage costs £79. The variety of treatments is just as broad too, with everything from body treatments to salon services, each using luxury Champneys and Clarins products. The Champneys brand is accommodating to us men too who find the spa quite intimidating. A range of grooming treatments are available as well as macho massages. I also like the fact the spa makes a effort to accommodate families so besides the couples massages for stressed-out parents (from £150 for 50 minutes of heavenly child-free time) there's also a mother-and-daughter and father-and-son massages at £150 for 50 minutes. 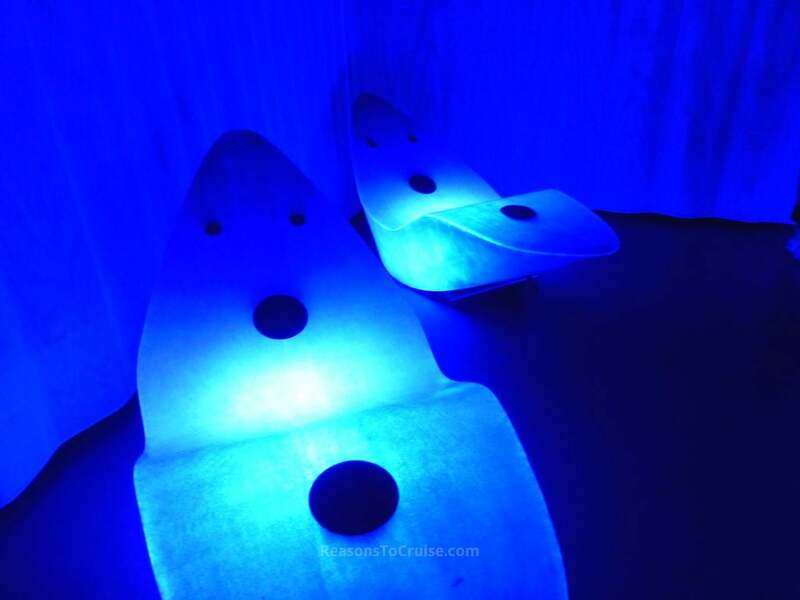 The couples massage room is beautifully decorated, is equipped with a private sauna, and is bigger than most cabins on the ship! Besides the treatments, the spa also has a thermal suite complete with a sauna, relaxing room, ice showers, and a really blue room equipped with loungers with built-in speakers. Should you feel overly energetic on your cruise, Champneys also hosts fitness classes and offers personal training services for a fee. At the top of the ship is a space reserved at the front for a very special venue, Indigo. At its heart is a lounge with floor-to-ceiling windows looking out to sea. Lots of comfortable seating make this a great place to chill in the day or early in the evening. When the ship heads to the Norwegian Fjords this observation deck will come into its own. Inside the lounge is also a nightclub, screened from the seating with a dancefloor and an interactive DJ system. If that weren't enough, there's a small casino that lines the port side of the lounge. Named after the latitude of the Meyer Werft shipyard where the ship was constructed, Latitude 53 is the main dining room. This two-storey venue wouldn't look out of place on a transatlantic ocean liner - it's so grand and elegant. You'll definitely want to take a selfie here on 'dress to impress' night! Expect a variety of dishes on offer daily to satisfy the British palate, with vegetarian and gluten-free options available too. Marella Explorer boasts 10 dining venues, each with a different theme and dress code to suit. Some are relaxed affairs while others are more formal. 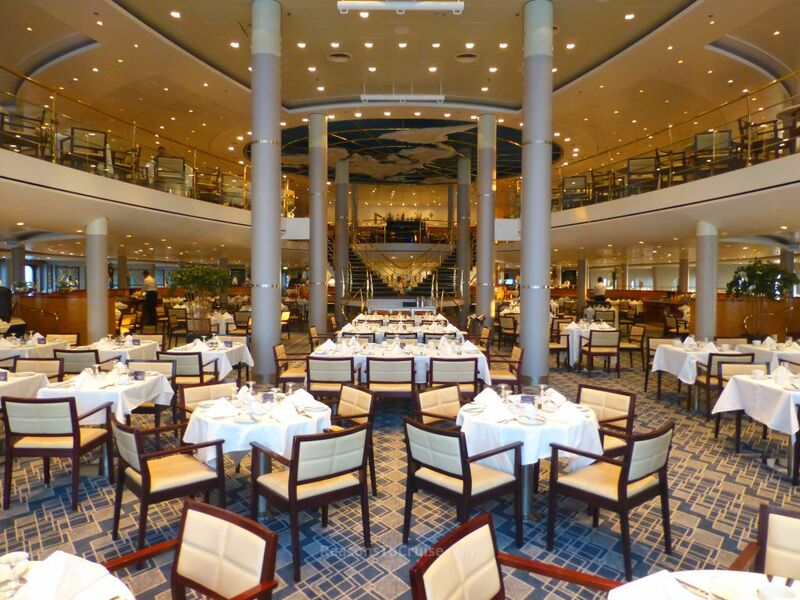 This main dining room is perhaps the grandest place on the ship. The lower deck is home to restaurant-within-a-restaurant Vista which specialises in Italian cuisine for dinner. A buffet with a variety of dishes that change regularly. Perfect for a quick lunch or snack. Expect to find burgers and fast food. Italian, Spanish, and Portuguese flavours. Try the Espetadas (traditional Portuguese meat and vegetable skewers) for £9.95. A steakhouse complete with an open grill. The cover charge is £28.95 per person. A pan-Asian restaurant with oriental decorations. The cover charge is £22.95 per person. This is a flexible space currently set up to create experimental French cuisine. It's £34.95 a head or £45 per person on 'Dress to Impress' night. Sushi and sashimi made fresh. Prices start from £9.95 per person for dinner. Ice cream made fresh onboard with flavours such as Banoffee and Piña Colada. £2 for two scoops. There's plenty of choice when it comes to bars too. Whether you fancy pre-dinner drinks or a cocktail watching the sun set, you'll find somewhere to quench your thirst. I like the feel of the Squid and Anchor Pub (think 'lounge' rather than 'cosy pub') but suspect you'd find me mainly at The Coffee Port, getting to know the fruits of the onboard chocolatier's labour very well. The Lounge, complete with neon pink piano, should come alive at night as should Indigo, the bar-club-casino all-in-one venue. From summer 2019, Marella Cruises is going all-inclusive. So you won't have to worry about racking up an eye-watering bar tab. Tips and service charges are also included so that's less to worry about onboard too. A Premium All Inclusive package is available for those wishing to upgrade. Besides the Champneys spa, the shops are definitely worth a browse. It's such a nice retail space on the ship, with a range of brands on offer - including Apple. There's even a Champneys store offering express treatments alongside stocking the range of Champneys and Clarins products. For some me-time, head to the Veranda, an adults-only area. Check out the private cabanas which can be hired for the day. Couples can nab a cabana for £99 a day (or £289 for a week) which includes a Healthy Detox Shot at the start of the day plus robes and slipper hire, and access to the Champneys Thermal Suite. For singletons, it's £69 for the day or £229 for the week. Staying outdoors, the pool deck is a great space. The pool is split in two by a stage so expect the entertainment team to make full use of that. A large screen will transform this area by night into an open-air cinema. There's a netted sports court for basketball or basketball, and there's a mini-golf course too. Inside, there a games room equipped with PlayStations, and a huge cinema room. When it comes to evening entertainment, head to the Broadway Show Lounge. Sadly I didn't have time to take in one of the 12 new shows but the initial feedback from those that spent more time on the ship is that they are of a very high standard. 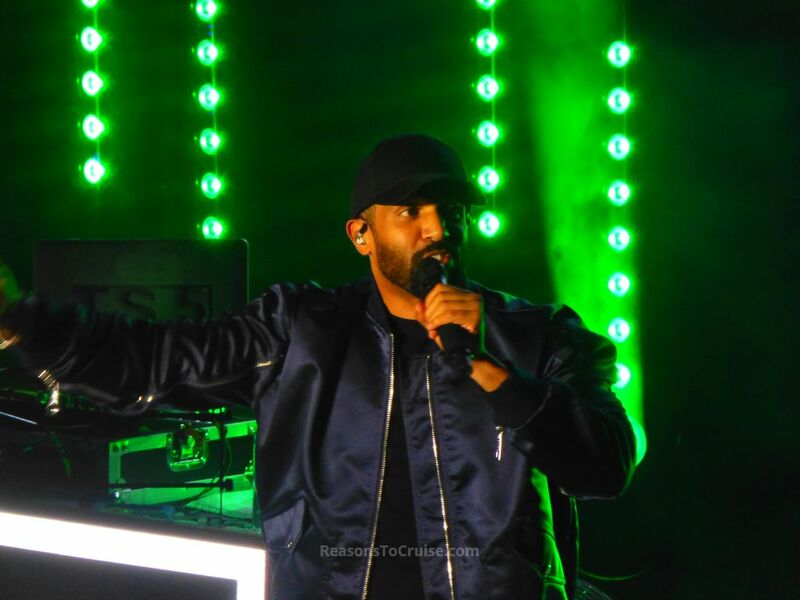 The theatre shows vary from telling the history of rock (Rockology) to recreations of music festivals (Festival) or a walk down movie soundtrack memory lane (Movies). There's even a show - Bud's Diner - reliving the carefree 1950's. During the summer holidays, the cast put on three bite-size CSI (Cruise Ship Investigation) shows for the kids. Speaking of the pint-sized sailors, children aged three to 11 year old can use the M Club. The club also comes with its own private shaded pool which is a great idea. Teens can use the Hideout - with a TV, games console, VR experience, and outdoor terrace - as a place to relax. The name 'Marella' translates from Celtic as 'shining sea', and the designers have gone to town on shimmering works of art. Keep an eye out for the blue Marella Cruises shimmering logo - it's one of the most Instagrammable spots on the ship. 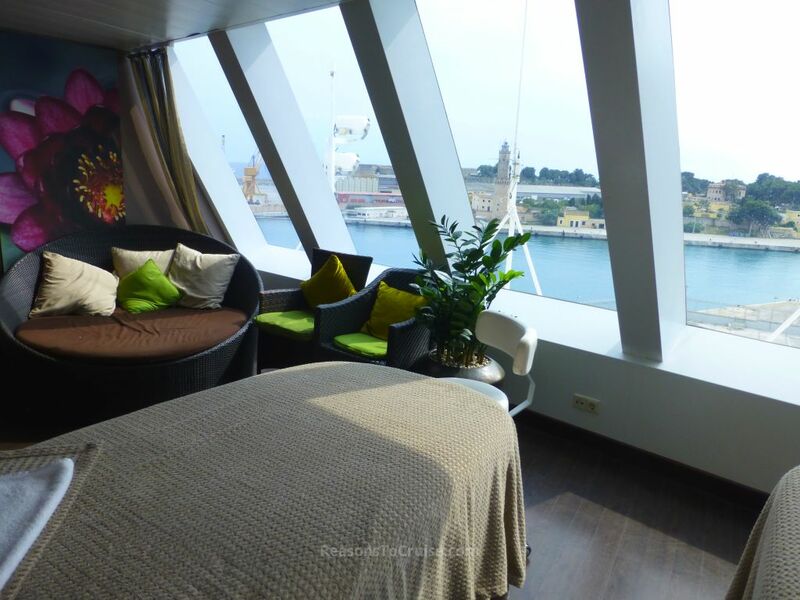 The ship has a small range of cabins to suit all travellers and budgets. Push the boat out with an Premier Executive Suite. Roomy enough to sleep four and boasting a massive balcony, this cabin also comes with perks such as Clarins toiletries and Champneys robes for use during the cruise. Junior Suites and Family Balcony cabins come with Premier Service too, which includes priority check-in (where available), a free pressing service for up to three items per person in the first 24 hours aboard, and free in-cabin continental breakfast once per week. 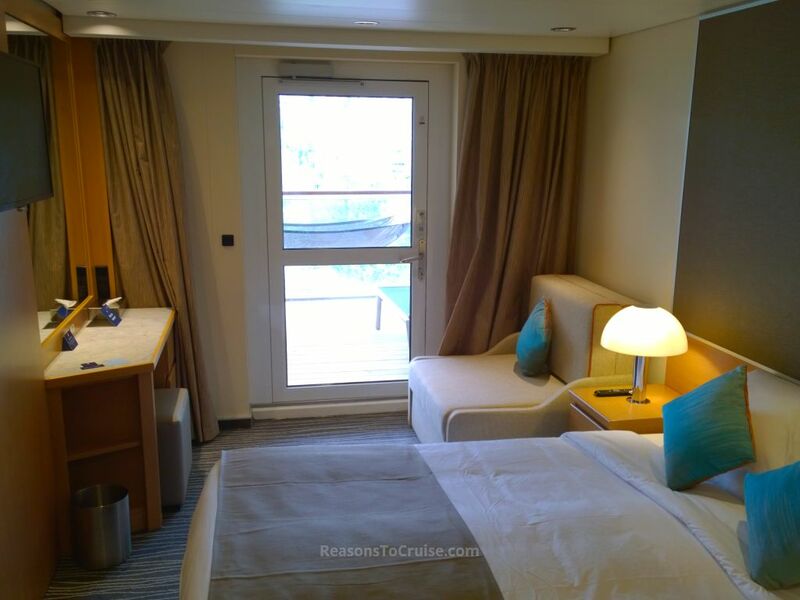 The usual range of Inside, Outside (ocean view), and Balcony cabins fills the bulk of the accommodation section on the ship. These are configured to sleep two, three, or four. My Large Balcony Cabin could sleep up to three and even came with a hammock on the balcony (why don't more ships have these?!). I nearly fell asleep on it in the warm light breeze to the soundtrack of gentle waves lapping. The ship boasts 30 Single cabins for solo occupancy, and are sized similarly to the standard Inside cabin designed for two. There's also eight Accessible cabins designed to better suit wheelchair users with wet rooms equipped with grab rails. For summer 2018, Marella Explorer homeports in Palma de Mallorca in the Balearic Islands operating four itineraries. What's really nice is that many of them include ports of call rarely served by other cruise lines - a perk of operating small and mid-sized ships. A repositional cruise across the Atlantic will see the ship homeport in Barbados for the winter, with a choice of five itineraries. Just like the Med, Marella Cruises has included some smaller ports of call to compliment the usual bevy of well-known and best-loved destinations. Highlights include Bequia in St Vincent and the Grenadines, Pointe a Pitre in Guadeloupe, and Kralendijk in Bonaire. For summer 2019, Marella Explorer will be heading to the UK homeporting in Southampton and Newcastle. The line-up includes sailings to the fjords of Norway and Iceland, plus tours of the Baltic Sea. When stacked against the competition in the British cruise market (as in P&O Cruises, Cunard, Fred Olsen Cruise Lines, Saga Cruises, and Cruise & Maritime Voyages), Marella Cruises is really starting to stand out from the crowd. Marella Explorer is a shining example of their new way of thinking. Marella Explorer is one of my favourite mid-sized cruise ships around right now. I really was impressed with what the company has done to transform the 1996-built ship. She looks as good as new thanks to modern and contemporary décor - it's my kind of vessel. The ship crams in a boat load of things to do, but its reasonably small size limits what it can carry. 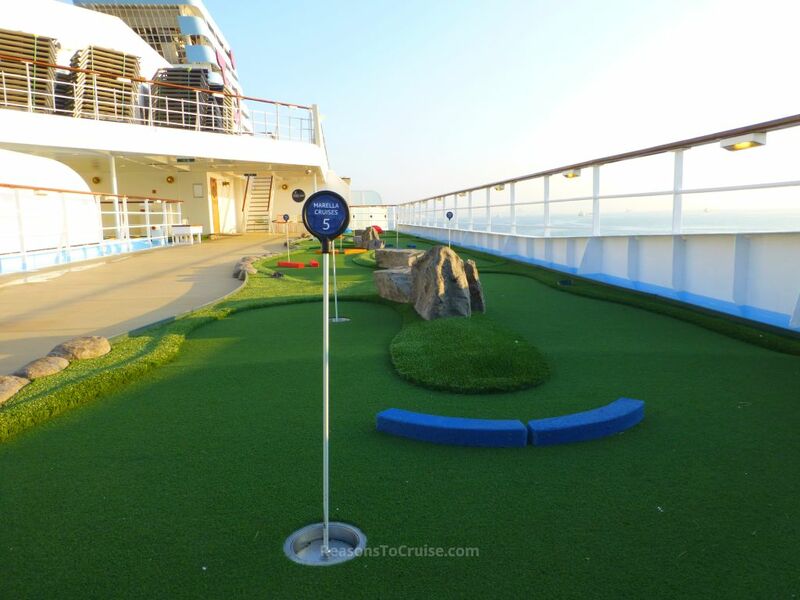 So you won't find adrenaline-inducing slides or zip wires on the ship, but aren't they just gimmicks anyway? Small doesn't mean cramped though. The benefit of an older ship is that it was constructed when passenger comfort was key and the guest-to-space ratio ruled the decisions - not the accountant. 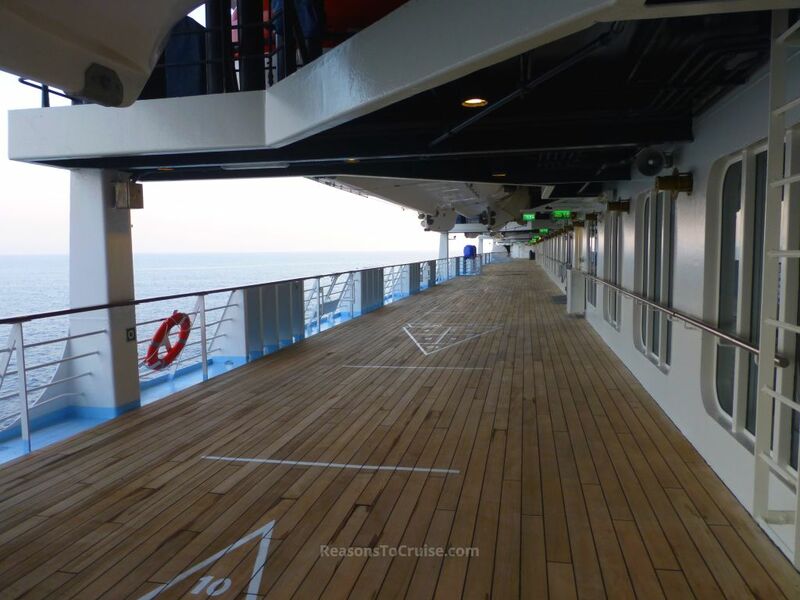 This means you get a wide promenade deck and plenty of space to relax around the ship. You're not crammed in like sardines on this ship - it's how cruising is supposed to be. Combine the onboard facilities with the port-intensive itineraries and you can see it's perfect for a carefully balanced holiday. Explore a new port of call by day and relax in the chic and comfortable ship in the afternoon, enjoying a Champneys massage or some time by the pool. Grab yourself a delicious meal before heading to the evening show or to the pub. Rinse and repeat daily for a really satisfying escape in style. Marella Explorer not floating your boat? Marella Cruises has a diverse fleet, so whether you're after an adults-only retreat or a family-friendly ship with everything your kids need on holiday, you'll find a ship to suit. Plus, the added bonus of booking a Marella cruise is that TUI can package your entire holiday from start to finish - meaning you can enjoy the same level of service throughout your entire holiday. Fly from 22 regional airports with TUI, enjoy airport transfers arranged by TUI, relax on a TUI-operated cruise, and transform your cruise into a cruise-and-stay holiday by adding a TUI hotel stay in one of more than 140 properties. Better still, it's just one company to deal with for everything. What do you reckon? Would you book a cruise on Marella Explorer? If so, which itinerary has caught your eye? Leave a comment below. Disclosure: TUI organised my trip to the Marella Explorer naming ceremony. I paid for domestic travel to and from Gatwick Airport as well as incidentals along the way. My opinions are my own. Marella Explorer is a mid-sized ship with a sleek, modern, contemporary design. Combined with varied itineraries with exciting ports of call, this ship is a great place to call home while touring the Mediterranean or the Caribbean. Sadly I wasn’t onboard long enough to test the signal strength. I contacted someone at TUI who confirmed Wi-Fi is available ship-wide on Marella Explorer. He said packages are sold by time period but they also have a consumption limit. He couldn’t supply pricing, and said that prices are available onboard. We are booked in July 2019 for the Baltic Cruise. 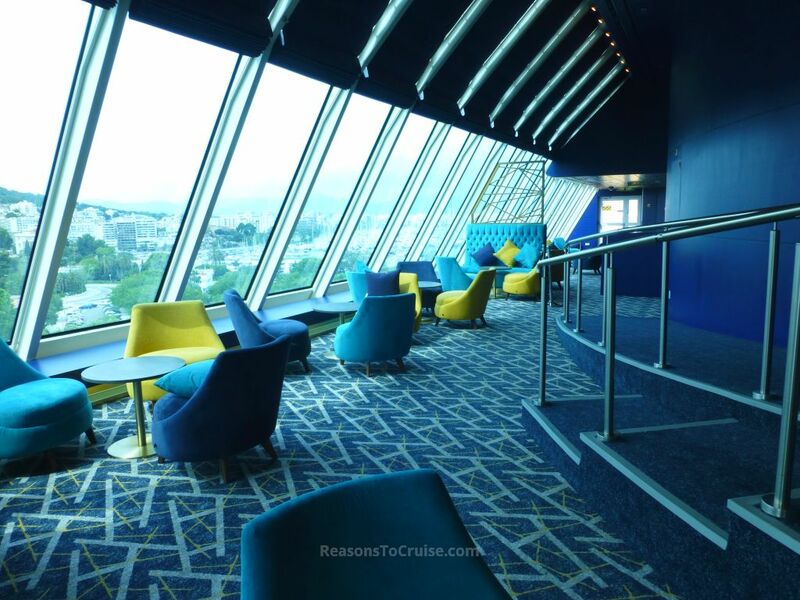 Have never cruised before so hopefully have made a wise choice…….from your review of the ship it certainly sounds amazing. We have managed an outside cabin in deck 4/5 so although not as luxurious as having your own hammock, I am sure it will be great. So looking forward to our first holiday in 10 years !!!!! That sounds like it should be a fantastic holiday. Marella Explorer is a great starter ship – not too big so as to daunt and overwhelm but not too small that you feel claustrophobic. I look forward to hearing what you make of the ship and the itinerary. We sailed on the Explorer’s maiden voyage 19 May 2018 and thoroughly enjoyed it. My favourite place to while away an afternoon with a cocktail was the Mediterranean Terrace with glass retractable roof. It has a conservatory feel to it with outdoor type comfortable futniture. There is a pizza restaurants to one side and tapas restaurant to the other. 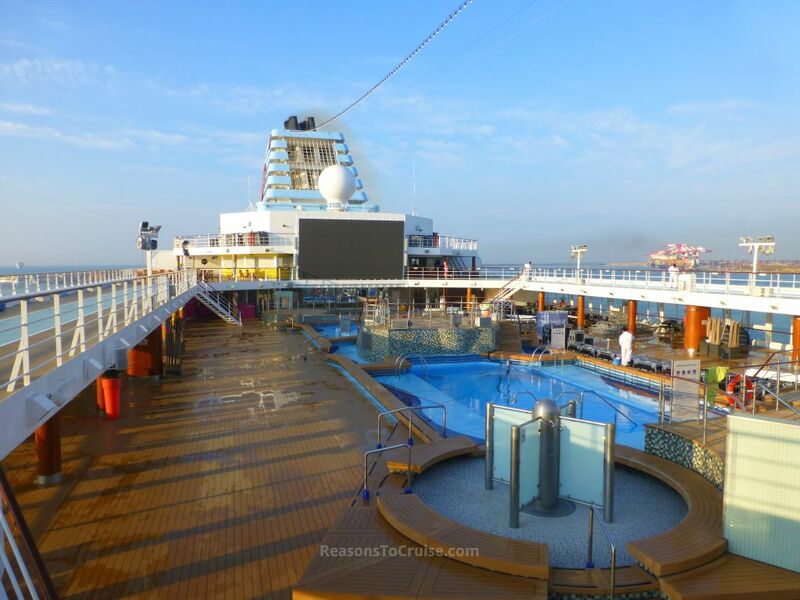 The indoor space leads to a large outdoor terrace which is the full width of the ship. Thank you for sharing your feedback. I suspected the Mediterranean Terrace would be a great spot to relax. How was the food there? We are considering sailing on the Explorer in January 19 to the Caribbean. I enjoyed your review of the ship, and sincerely hope it is a truly honest opinion and not just a journalistic review because you were probably being entertained by Tui. So tell me again is she really as good as you make her sound. All of my content on here is written based on my own personal opinions. I’m pretty sure I’ve upset some PR folks as my reviews often include fair criticisms alongside the positives. I genuinely have been looking at the Marella Explorer itineraries since returning home as I am desperate to get back on the ship – price on the few itineraries I can book (thanks to school holidays) is the only issue. Otherwise, I’d be back in a heartbeat. The ship is a really comfortable size (not too big, not too small) and the decor is modern and very fitting, with a nice mix of quiet and lively spaces. I want to go back and spend more time in the Champneys Spa, snoozing in the hammock on my balcony, and dining in the grand-looking dining room. When combined with the action-packed itineraries, I really do think this is a well-balanced holiday option. If you are looking for a mid-sized ship that caters for the British market and you’d prefer something newer and more akin to a boutique hotel, look no further. This was my first experience of TUI and a night on Marella Explorer is great for sizing her up, but not enough time to get a feel of the staff (which makes or breaks a ship). 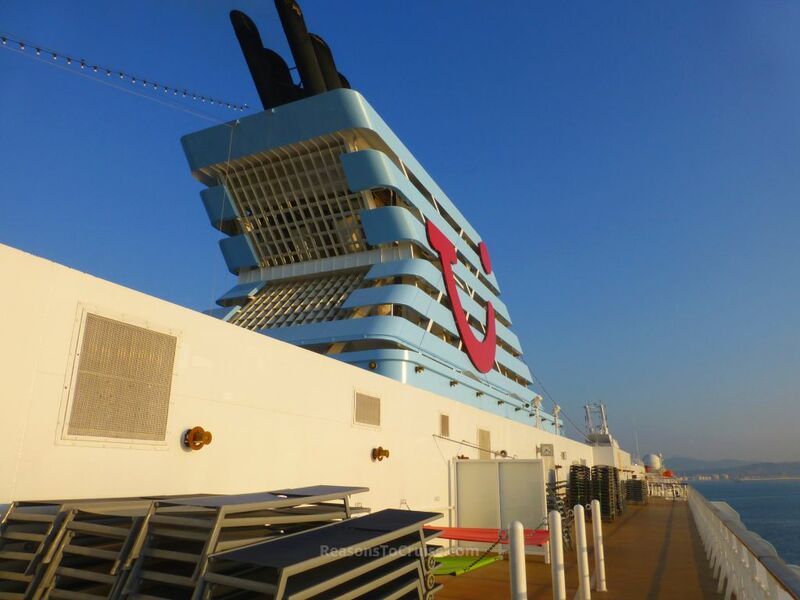 I’d like more time to better compare the experience with P&O Cruises and Fred Olsen, but the staff I did encounter were all friendly and helpful. Whether that had something to do with the TUI and Marella bosses being onboard is anyone’s guess. Have you sailed with Marella Cruises before? It is good the see reports like this, we are on Explorer on 1st September for 2 weeks, we have spoilt ourselves with an executive suits, it would be good if Tui updated their website with up to date photos of the cabins since the refurb. Thanks. I bet you’re looking forward to your trip – the Executive Suite is a really nice space. Thank you for your very kind words. It really is such a lovely ship with a premium feel – you’ll have a great time. Happy birthday!